This shot was taken on a sunny day using my Canon G10. I wanted to get the cliffs, the sea and the field of buttercups all in one shot, so I laid down to get the right perspective. My aperture setting was at f4.5 and shutter speed was 400. 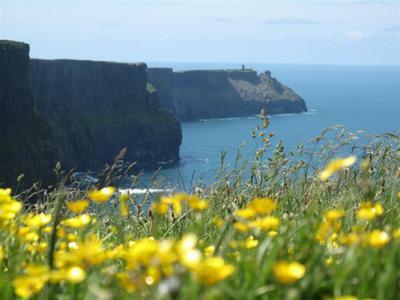 The Cliffs of Moher sit on the west coast of Ireland, and get pummelled by the Atlantic Ocean day in and day out. Which means that they get eroded into the most amazing landforms. Cliffs, sea arches, stacks...they're all here. I once visited the area and stayed in Galway. Dramatic beauty is a phrase I'd use to describe it. Sadly, when I went it was blowing a heck of a gale, and there was not a buttercup in sight. So it's nice to see Darlene's photo - at least now I can see the view that I missed! On a photography note, good to see the use of the aperture to control the depth of field. This has kept the cliffs in crisp focus but blurred the foreground. It's a nice technique. Just for balance, I wonder if there's a photo lurking somewhere on the memory stick of the reverse - focussed buttercups and a blurred background? Nice photo all the same, and thanks Darlene for reminding me of the beauty of the west coast of Ireland.